Right now I am working with one of the world’s leading Credit Card Company. How did ApnaPlan Came to Existence? This blog can be considered as my online diary where I write about my tryst with my investment decisions. In the 700+ posts on this blog you will find articles on Personal Financial Planning, Investments, Retirement Planning, Insurance, Loans, Fixed Deposits, Provident Funds, Stock Markets, Gold, Silver, Real Estate Investment, Credit Cards, Credit Score, Taxation, Inheritance Planning and Reviews on various Financial Products. Other than blogging, I like to keep myself updated with the latest business happenings in personal finance space and love reading related blogs, Magazines and watching Business News TV Channels. I hope this blog would benefit you in making better financial decision about your money. If you love reading Apna Plan you can subscribe to it. The subscription would enable you to receive all the new articles directly into your email inbox. Click here – A page will open up which asks for your email. You will then receive an email from “Feedburner Email Subscriptions”. That email will have a link that you need to click in order to receive the daily emails. If you don’t get the email immediately, check your spam folder. Sometimes it goes there, mark that email as “Not Spam” and it will not happen again. You will get maximum of one email a day. If there is any post that day, you will be emailed; else no email. With more than 2.5 Lakh unique visitors and 3.5 Lakh page views monthly, ApnaPlan has a strong reader base that has been growing since 2011. 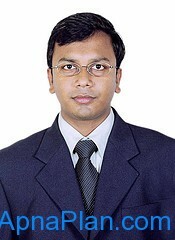 Reader profile includes people like NRIs, HNIs, and entrepreneurs looking for investment opportunities in India. If you would like to advertise on the blog, please contact me. Or contact me on facebook and Google Plus and follow me on Twitter. I am not affiliated to any company, agent or brokers for selling/ recommending investments and all the information in the blog is for educational purpose only. Please consult a qualified financial planner or do your own research before making any investment.